"Difficult to understand and enjoy Machu Picchu BUT only by trekking to it...."
The 3 day 2 nights Huchuy Qosco trek is a really nice and not too challenging option that combines espectaculr mountain views, original Inca Trails a community visit and a guided tour of the little known Inca site of Huchuy Qosco which is located in the heart of the Sacred Valley of the Incas. Taking you off the beaten track you get away from the all the crowds of the better known treks but still get to enjoy all the amazing things Peru has to offer. 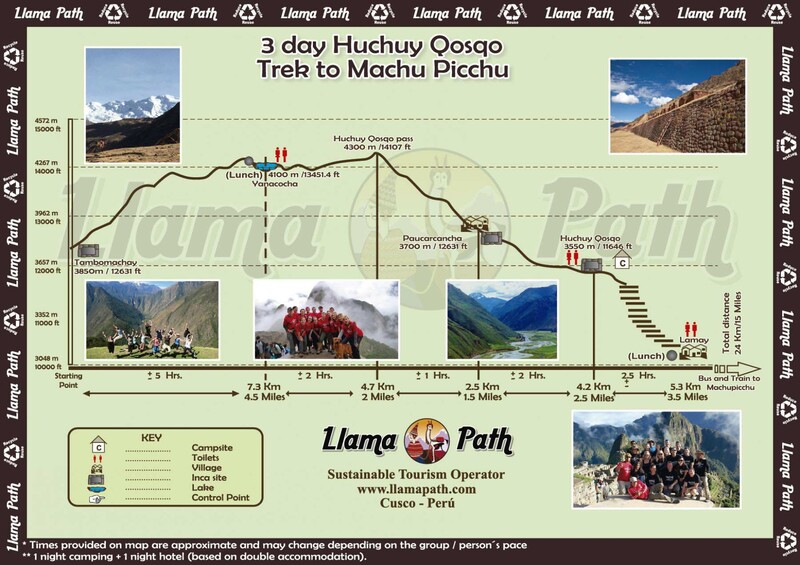 The Huchuy Qosco trek is perfect for those with a short time frame or who are looking for an easier trekking route. Overall Difficulty - Easy to Moderate. (Pick up time 05:00am) starting in Tambomachay just outside of Cusco our path leads us over high passes, through valleys and small communities. With large swathes of grassland and small lakes (dried out in some seasons) the area is home to a wide variety of birds including Andean Geese, Partridges and Lapwings as well as a variety of birds or prey, all of which are regularly spotted throughout the day. Our goal for today are the andean and poor villages of Patabamba and Siwas located close to a small lake (dries out in dry season). Patabamba is a traditional Andean community with a small school and a tiny Plaza; located high above the Sacred Valley the people here still maintain the customs and traditions of ages past and the majority of villagers gain their income from agriculture (potatoes) and herding llamas and alpacas. As only a few tourists come this way the people are always intrigued to see who has come to visit their village and to welcome them with open arms. Today has two main focuses, learning about the customs and culture of the Andean people and a visit to the Inca site of Huchuy Qosco (for a secon time!). Waking up early we'll be taken by our guide to one of the houses (can be visited on day 1) where we'll get to meet a local family. The people are incredibly welcoming and are just as eager to learn about you as you are of them; they don't get many visitors in this area and are always interested to find out about you. After the visit you'll have the opportunity to give any gifts you've brought for the local people and also to buy some of the locally made. Following the visit we'll make our way to Huchuy Qosco. The route follows an original Inca Trail that leads us down a beautiful, secluded valley that is filled with native plants, flowers and birds. It really feels like another world compared to the high grasslands we've left behind. In total it takes about two and a half hours to reach Huchuy Qosco and after a break to rest and take in the views of the Sacred Valley you'll have a guided tour of the site to learn about the Inca people and their culture. In the afternoon we head down in to the Sacred Valley to the village of Lamay where we take a bus to Ollantaytambo and then a train to Aguas Calientes. Porters to carry cooking and camping equipment plus 7kg of your personal items. Important: price depends on number of people in your group (more people pay less). Important 2: Price includes up to 7 kilos of your personal belongings to be carried by the Porter (NO need of extra Porter hire!). Student rate: In order to obtain this discount you must have a valid University Student card (and be NO older than 25 YO). It is important you scan and e-mail this to us at the time of booking and that it is valid on the date you are booked on the alternative trek (you will need to show the real University card upon your arrival here in Cusco and in Machu Picchu). Payment of deposit: For any of tour Adventure treks ending in Machu Picchu. US$ 325 per person for the Huchuy Qosqo + Wayna Picchu or Machu Picchu climbing.